1. All entry fees should be paid by 31st October of the current season. 3. Clubs entering more than one team in the league must notify the controller of four nominated A team players (and four B team players in the event of three teams representing one club, and so on). This should be done at the time of entry. 4. No players shall play for more than one club in a season. 5. (a) All matches shall commence at 7:30 pm (except Rushden home games which start at 7:15) and shall be played with clocks. The time limit shall be 35 moves in one and a quarter hours. Following black's 35th move the clocks shall be turned back by one quarter of an hour and the match shall be played to a finish. The conduct of the quickplay finish shall be governed by the British Chess Federation Quickplay Finish Rules and by the additional rules for events which do not have an arbiter. All players are required to familiarise themselves with these rules. (b) It is the responsibility of the home side to have the venue and boards ready for a start at 7:30 p.m.( if Rushden at home 7:15) If the venue is not ready for play at 7:30 p.m.(or 7:15 if applicable) the clocks are to be adjusted on the home side's time to compensate for the late start. (c) The clocks should be started at 7:30 p.m. whether or not the opponents have arrived. If an opponent has not arrived after one hour he shall have forfeited the match. Captains may substitute prior to the clocks being started or, if a player has not arrived, after 30 minutes but before one hour has expired. (a) The general rule on board order in the Silver King and Knock-Out Cup competitions is that the players shall be ranked in descending order of strength, based on the most recent published ECF grades (normal play, not rapidplay) . (b) Where a player is ungraded, the club shall estimate his/her grade on the basis of their knowledge of his/her current playing strength. This estimated grade, once used to determine board order in a match, is fixed for the season, except where a special dispensation to change is given by the competition secretary, or where information from the ECF grading system becomes available mid-season. (c) The grades used in matches shall be recorded on the results card to be submitted to the competition secretary, estimates being marked "E". (d) To allow for variations in current playing strength, two players may play in reverse order to their published or estimated grades provided that their grades do not differ by more than 10 points. For juniors the maximum permitted difference is 30 points.this rule can be ignored if agreed by both captains. 7. The result of the match shall be reported to the controller on the day following the match. The responsibility to report the result rests with the winning team, or in the event of a drawn match, with the home side. 8. The controller has full authority to penalise teams for breaking the above rules, by banning players, deducting match points or taking any other action, as he deems appropriate. 9. 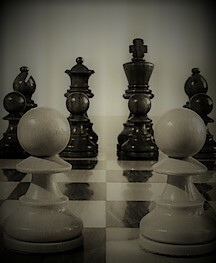 All competitions run under the auspices of the Northants Chess Association (Silver King league, Knock-Out Cup, Cole Trophy and county rapidplay events etc.) are non-smoking events. It is the responsibility of the arbiter or home team captain to ensure that the playing conditions comply with this rule. 10. Mobile phones must be switched off. If mobile rings during a match the game will be forfeited. Hand held computers must not be used during the course of a match. 11. This Silver King Trophy shall be awarded to the team scoring the most match points at the end of the season in Division One. Two points shall be awarded for a match win, and one point for a match draw. If two or more teams finish on the same number of match points, then the points scored in the individual matches between the teams shall be used to determine the higher placing. In the event of this not giving a decisive result for the league champion in any division, a “play-off” match shall be played. In the case of Division I, if this "play-off" is drawn, then the two teams shall be declared to share the title. In the case of Division II in event of a drawn play-off match, the tie shall be decided by adding the board numbers of the decisive games for each team, the lower sum giving the winning team. If this fails to produce a result, the scores shall be recomputed disregarding the result on Board 5, or if this game is drawn, Board 4 and so on. In the event of a match in which all games are drawn the fixture will be replayed. 12. The bottom team in each division, excepting the lowest division, shall be relegated at the end of the season. The highest team in each division, excepting the first division, shall be promoted, unless the bottom team of one division and the top team of the division immediately below are from the same club, these two teams shall not be promoted nor relegated. No team may play in a higher division than a higher team from the same club. In order to meet this requirement, the controller may move teams from the same club between divisions. If the captains cannot agree a new date, the controller will fix the new date. 14. Any club having more than one team in the league may play one nominated player from the immediately stronger team in the B and subsequent teams. This player will be allowed to play in grade order for the lower team. Nominations may be changed by writing to the controller, who will decide if the change is permitted. 16. The league competition must be completed by 31 May of the current season. 17. Standard number of players in each team is four but may be increased with the agreement of both team captains. 18. Where a club has more than one team entered in this competition rule (3) will apply. 19. Players from a lower team may play for a higher team, but players nominated for a higher team may not play for a lower team. 20. Colours shall be decided by the toss of a coin, the winning team taking White on Board 1 and colours alternated thereafter. 21. In the event of a drawn match, the tie shall be decided by adding the board numbers of the decisive games for each team, the lower sum giving the winning team. If this fails to produce a result, the scores shall be recomputed disregarding the result on Board 4, or if this game is drawn, Board 3 and so on. In the event of all games being drawn the fixture will be replayed. 22. The competition must be completed by 31 May of the current season.